Heeey... I'm wearing pink and it's a Wednesday! That usually never works out! When I was looking for a base for Sinful Sunrise, RADiant definitely called my name. It's part of the Chalk Board Diaries Collection from SinfulColors. 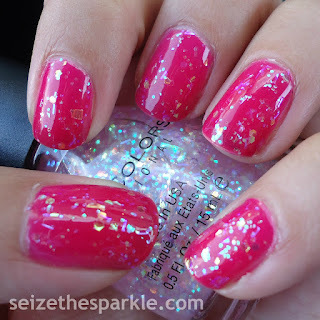 The bright pink base really lets the glitter in Sinful Sunrise pop! Sinful Sunrise takes the flakies from Pink Ansen, mixes them with the opalescent glitter from Pinky Glitter, and adds in bar glitter that flashes blue to purple for fun! PR describes this polish as a "warm pink coral with 3D glitters," and you definitely get that vibe. 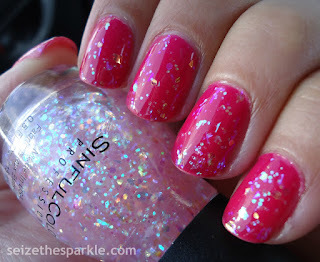 The mix of glitter in here really adds a ton of sparkle to your nails! Application was awesome, too. Just one coat gave me all the glitter you see in the photos. There's nothing I love more than a glitter polish that is seriously loaded with glitter. It makes layering a whole lot easier, and the bottle lasts a whole lot longer... and let's be honest, you really can't ever have too much sparkle! Sinful Sunrise is part of SinfulColors Class Act All Nighter Collection. You can find it on display at Walgreens for $1.99 a bottle. The full All Nighter Collection also contains Blue Sensation, Casablanca, Daredevil, Fig, Glass Pink, Ice Dream, Late Night Haute, Night Owl, and Purple Diamond. Follow SinfulColors on Facebook, Instagram, and Twitter!